There are temples to Chakranarayana, Ganesh, Ram and Lakshman here. Enroute to the river, there is a shrine to Veda Vyasar. There is also the Puran Mandir. The Mahabharat was recited here and Naimisaranya is mentioned freqeuntly in both the Mahabharat and the Ramayana. The Chakratheertha is considered very holy and a dip here on Somavati Amavasya is considered to be sacred. The chief temple here is that of Lalita Devi. Large crowds collect here on new moon days. Theertham - Chakra Theertham, Gomukhi river, Nemi Theertham, Divya-vichraantha Theertham. Features The sanctum sanctorum currently observed was constructed only recently and the legendary places could not be traced. The Moolavar of this Naimisaranyam Divyadesam is Devarajan. He is also named as "Sri Hari". Moolavar in Nindra thirukkolam facing his thirumugham towards east direction. 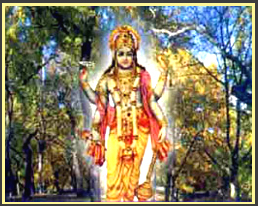 Prathyaksham for Indiran, Sudharman, Devarishi, Soodhapuranikar and Vedavyasar. Naimisaranyam is located at the junction of the roads from Sitapur and Khairabad, 20 kms from Sitapur and 24 kms from the Sandila railway station. 45 kms north of Lucknow in Uttarpradesh. Naimisaranya is also known as "Nimsar" or "Nimkhar" and is located on the left bank of the river Gomati.